Pine Cones with pine nuts. 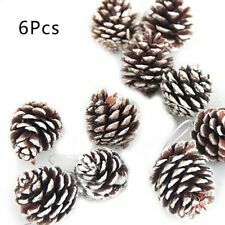 6pcs Christmas Pine Cones logs/snow white Christmas tree Hanging pendant Set. Model: Pine Cone. Pine cone only, other accessories in pictures are not included. 6 x Natural Pine Cone. These make the perfect decoration for your Christmas tree, house or anywhere else. Material: Natural Wood. These huge pine cones are grown from the longleaf pines of southwest Louisiana. Not only are they long, but they are also big and fat. They can easily stand up on their end or lay on their side. When you order this item you will receive a bakers dozen (13) box of pine cones. 75 Georgia Pine Cones. All natural, no scent added. Semi gloss sealed, with floral tape wrap. 25 spruce cones from my land in North Central Wisconsin. Bulk quantities also available. Each bag contains 30 assorted pine cones and cinnamon sticks. 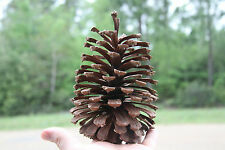 Pine cones are a natural product with cinnamon scented and each cone will be slightly different. 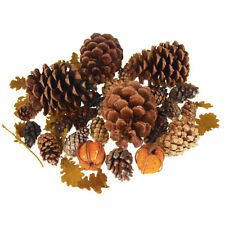 Pine cones are a natural product with artificial pumpkins and leaves. Each cone will be slightly different. Each bag contains 40 assorted pine cones, leaves and pumpkins. 75 Kiefernzapfen. Naturmaterial in verschiedenen Größen. Wir helfen Ihnen gern. Coulter "Widowmaker" Pine Cone 13"
Coulter pine cones range from sizes from 7" to 13". The circumferance can be from 6" to 10". The weight varies from 2 lbs. to 4 lbs., depending on the size. I hike in the hills of Lake Arrowhead, Running Springs, and Twin Peaks to find these cones. Sugar Pine Scales, carefully cut off of very clean cones. For art projects and crafts. Make your own pinecone flowers. Each order will be filled from hand selected, cleaned cones. (New harvest 2019 !!! •)› Alder Cones Alder Cones are very similar to Indian Almond Leaves. They release tannins into the water which have antibacterial and anti fungal propetIes while looking great in your tank. These beautiful pine cones are grown from the long leaf pines in Central Florida. Free standing or lay on side. You will receive 12 plus one extra pine cone. These pine cones are in their natural state. Components: Real White-Tipped Pine Cones, 1 Bunch of 8 Plastic Blueberries and 1 Bunch of 8 Plastic Red Berries. We will neither check "gift" box nor under-declare the value. 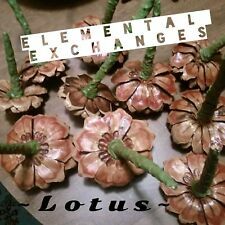 Lot of 50 - Oregon Ponderosa Pine Cones Organic Natural Large size 3" - 3.5"
Grade A fresh Ponderosa Pine Cones. All natural and organically grown in the Blue Mountains of Eastern Oregon. We use no sprays of any kind on our property. All of these pine cones were heat treated to kill any spiders, ticks or other nasty bugs! Beautifully Decorated by Nature with White Sap! Hand-Picked in Maine, USA. We will neither check "gift" box nor under-declare the value. Harvested in 2017 & 2018. Pine Cones Huge Big Decoration Arts and Crafts Home Decor Lot 3 Large Real 10"
Lot of three Sugar Pine Cones. All major flaws will be noted. I have for sale a lot of Pine Cones, Tiny and Small sizes, Christmas Decoration, that I found when I was cleaning out my Grandmothers Attic. They look in nice condition. Lot 2 large sugar pine pine cones. Approx: 13" high x 3" wide. All of my Forest Products are always Forest Friendly. You are looking on a lot of 20 Spruce pine cones. The pine cones are in their natural state. The pine cones are right from the tree. They are intact with no broken scales. Pinecone Flowers Lot of 50. If you are thinking Wedding flowers, or just really want tons of them. almost any number of flowers can be crafted and customized. I can also make them into an AMAZING centerpiece. ". Grey Pine Brachs, removed from the cone. Foothill Pine Digger Pine Ghost Pine. Make your own pinecone flowers. Each order will be filled from hand selected, cleaned cones. LOT OF 15 CONES. GIANT SEQUOIA. ALL OF MY FOREST PRODUCTS ARE FOREST FRIENDLY! 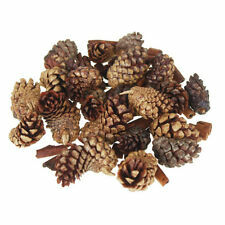 Pine cones are a natural product with cinnamon scented and each cone will be slightly different. 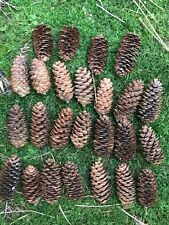 (LOT OF 30) MINNESOTA NATURAL PINE CONES. aprox (3"- 5" long) (1"- 2" wide). Lot of 100 - Oregon Ponderosa Pine Cones Organic Natural Medium size 2.5" - 3"
MIXED CONES FOR CHRISTMAS DECORATION, FLORAL MOUNTING, CRAFT SUPPLIES. ONE LOT OF. 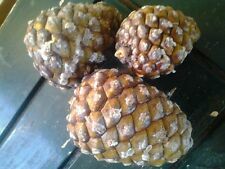 Lot of 5 Monterey Pine Cones (Dry and Open).